just to let you know that the restoration work is done, and the church is looking wonderful. Services have resumed. We would like to thank everyone who made the restoration possible. We are still fundraising and will let you know when and where the next event will take place. Walk up or down Fife Street, as generations of Dufftonian's have done, and you cannot fail to notice the lovely church building set back from the road. 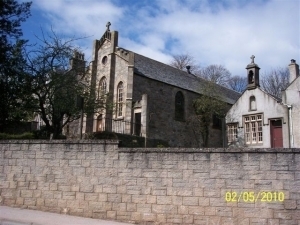 St Mary's RC church has stood there for almost as long as the modern town of Dufftown, which was laid out in 1817 by the Earl of Fife. Only eight years later in 1825 Our Lady of the Assumption was built. In those days it stood alone amongst fields. Though the schoolhouse is now a meeting room and the church house is divided into flats a loyal congregation still worships at St Mary's regularly. The church has a serious problem; dry rot is creeping through the building and the estimated cost for the restoration stands at GBP150,000. 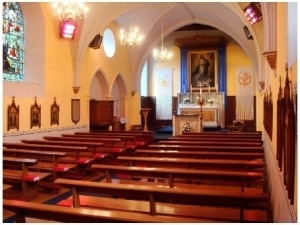 Many local people have enjoyed social events there or attended baptisms, weddings and funerals. Exiles hold records of their ancestors' baptisms and marriages and visit when digging into their family history. St Mary's is in big trouble. The parishioners do what they can to support and protect their church building. Fund-raising events have been held over the last few years and will continue we are grateful for the support recived so far. Now the parishioners of St Mary's are looking to set up a Friends of St Mary's group for local and expatriates that would help with the costs of restoration. The church is a landmark on our horizon and a pointer to our past. I am sure you would not want it to disappear forever as it is part of Dufftown's history. If you would like to help or if we can give you any information about the church please do not hesitate to ask.